The medication magnesium sulfate is given to patients to address several medical conditions. The level of this drug is monitored in the body because overdosing on this drug can produce a lot of untoward symptoms [1, 2]. Magnesium is a mineral that is required by the body for optimal functioning. If an individual has a low level of magnesium because of conditions such as theophylline toxicity or digitalis toxicity, magnesium sulfate is given to increase the magnesium level. Aside from this indication, magnesium sulfate is also use to prevent preterm labor. It is thought that magnesium lowers the amount of calcium, which is the mineral that is primarily necessary for muscle contraction. The low level of calcium in the system promotes relaxation of the uterine muscle. Side effects of taking magnesium sulfate may include weakness, poor reflexes, difficulty in breathing, low blood pressure, sweating, and headache [1, 2, 3, 4]. How much is Magnesium Sulfate Toxicity? The normal level of magnesium in the body is about 1.5-2.5mEq/L. As the amount of magnesium in the body increases, symptoms of magnesium toxicity will begin to manifest. Initial symptoms will appear as the serum level reaches 4mEq/L. As the level approaches 10mEq/L, more serious complications will be seen in the patients. If the level reaches more than 12mEq/L, it may be fatal to the patient. Decreased renal function increases the risk for magnesium sulfate toxicity because of the failure of the body to clear the drug from the system [1, 2, 3, 4, 5]. One of the initial magnesium sulfate toxicity symptoms is a decrease in the reflexes of the person. This is due to the blocking of the transmission in the neuromuscular receptors. The blood pressure will also decrease at this point. Other symptoms that may be present are nausea, vomiting and flushing of the skin. Further increase in magnesium level may lead to facial paresthesia and muscle weakness. When the patient’s serum magnesium level reaches 10mEq/L, it may cause a paralysis of the respiratory system and bradycardia or a decrease in heart rate. There are instances where patient with this serum magnesium level experiences complete heart block and myocardial infarction [1, 2, 3, 4, 5]. An overdose in magnesium sulfate rarely happens at home because this drug is only administered at a hospital. If a patient manifest with the initial symptoms of toxicity, a lab test should be done to measure the level of magnesium. Mild to moderate symptoms may be managed by stopping the administration of magnesium sulfate. When a patient exhibits respiratory depression or cardiac problems, calcium gluconate will be given to the patient. Calcium is known to antagonize the effect of magnesium and the administration of this drug may cause a marked improvement in the symptoms. Other medications that may be given include furosemide which will promote the excretion of magnesium in the urine. The serum magnesium level will be continuously monitored until it returns to the normal level [4, 5]. Blood monitoring should be performed to patients who are receiving magnesium sulfate to ensure that their serum magnesium level is within the normal range. Drugs that are used in the management of toxicity such as calcium gluconate should always be available in areas where magnesium sulfate is given. For health professionals, the medication should be counter-checked with the order of the physician to prevent medication errors which may lead to magnesium sulfate toxicity. 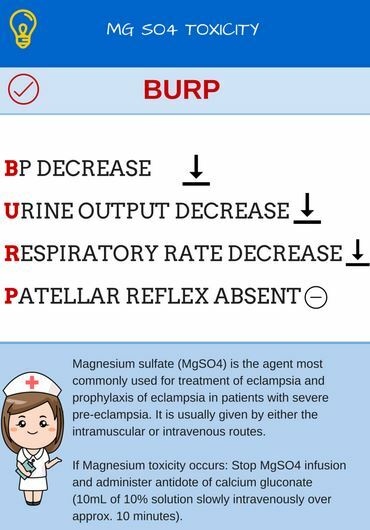 When giving a magnesium sulfate bolus to the patient, remain at the patient’s bedside for 15 minutes to assess for any signs of toxicity [4, 5]. These are just some information on the overdose of magnesium sulfate. Please feel free to share any more information about this condition that you may have in the comment section. Institute for Safe Medication Practices. (2005). Preventing magnesium toxicity in obstetrics. Institute for Safe Medication Practices.